In a challenge to his own agency’s policy, Justice Department Inspector General Michael Horowitz on Wednesday asked lawmakers to give him authority to investigate misconduct by his department’s attorney-prosecutors, who under the current arrangement answer only to Justice’s separate Office of Professional Responsibility. 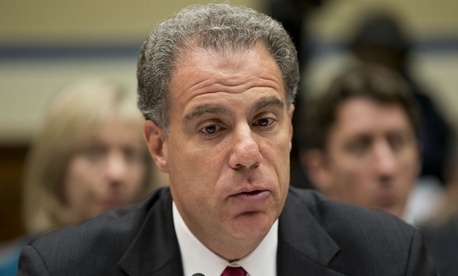 Michael Horowitz, doubling at a House Oversight and Government Reform Committee hearing as both an IG and the chairman of the Council of the Inspectors General on Integrity and Efficiency, led the IGs' charge in favor of larger budgets, quicker nominations for vacancies and long-sought subpoena power to compel testimony from retired agency employees. The hearing was billed by Chairman Trey Gowdy, R-S.C., as an examination of how the government’s 73 watchdogs have taken advantage of the 2016 IG Empowerment Act, which gave wider access to agency documents and streamlined investigative procedures into waste, fraud and abuse. He bemoaned the 14 IG slots that remain vacant (President Trump has nominated seven), noting that the Interior Department’s IG slot has been unfilled since 2009, and the National Security Council IG nominee named in June still awaits a floor vote. According to the IG council, IGs as a whole in fiscal 2017 brought in a total of $26.3 billion in potential savings from audits, and thus far in fiscal 2018 some $223.53 million of potential savings. “Compared to the IG community’s aggregate fiscal 2016 budget of about $2.7 billion, these recoveries and potential savings represent about a $17 return on every dollar of taxpayer money invested,” Horowitz testified. OIG investigative work that year resulted in 4,894 successful criminal prosecutions; 1,580 successful civil actions; 6,448 suspensions and debarments; and 4,315 personnel actions, he said. Unfortunately, Horowitz added, Trump’s budget called for reductions in some IG budgets, the bulk of which goes toward the personnel, not the buildings, who perform the audits and investigations. Kathy Buller, IG for the Peace Corps and executive chair of the IG council’s Legislation Committee, said now “all means all” in crucial IG access to documents. That has brought “an appreciative, positive change in culture” particularly in encouraging whistleblowers and victims of sexual assault in the Peace Corps to come forward. On the vacancy question, Horowitz stressed that the IG counsel has a “very good working relationship with the White House in vetting candidates. In the meantime, that council works to back acting IGs, “but there is a significant difference [for an IG] in knowing that you’re staying,” he said. For the future, what the IGs want (besides larger budgets) are new powers—included in last year’s House bill but rejected by the Senate, for “testimonial subpoena” for former employees and contractors. Too often “department employees conveniently retire on the eve of when we want to ask them questions,” Horowitz said, which puts them out of reach. “The resignation of federal employees has substantially hampered audits, investigations, or other reviews into matters within the scope of that individual's responsibilities,” Buller added. Such subpoena power is already enjoyed by the Defense Department’s inspector general, who “uses it responsibly” and narrowly, Horowitz added. “Just having the authority often means you don’t have to use it,” he said, and the draft legislation contains oversight provisions, such as a three-IG body to review its use. But the department worries that IG involvement would have “a negative impact on Justice’s ability to pursue criminal cases the IGs may not know about,” Horowitz said. Asked for the counterargument, Horowitz said the Office of Professional Responsibility department feels it is managing them effectively under the current arrangement. In the future, the IGs would like to enhance training, create a “whistleblower-friendly page” on the IG website and create a compendium of outstanding IG recommendations on its new website Oversight.gov, the witnesses said. The Justice IG’s ongoing investigation of fired FBI Director James Comey’s handling of the Hillary Clinton probe during the 2016 election is “not being impeded in any way” and moving in parallel with Congress’s work, Horowitz said. Most of the drama of the hearing centered around arguments by ranking member Rep. Elijah Cummings, D-Md., about a lack of cooperation from the Transportation Security Administration in providing documents about retaliation against whistleblowers exposing travel safety risks. He gave a long narrative about bipartisan panel subpoenas for testimony from three TSA officials sought since March: the deputy administrator, the acting assistant administrator, and the chief counsel. Chairman Gowdy agreed that the panel will seek to enforce cooperation at a coming hearing in Baltimore.